Arwen is calling the Stampotique Designer's Challenge (SDC 162) this week and the theme is "Under the Sea." The design team has really pulled together an exciting group of cards and projects for this theme. I've decided to use Amy Wilson-Wellenstein's Caerleon and Gawan in this collage card. My background is a light colored wash on an old book page. Layers with collage scraps and stitching. The fish are colored with Copics and accented with white gel pen. Now for a little fun. If you want to create ATCs from cards you will mail to friends and family you can scan them into a photo program. Adjusting and varying the color, you can create a set of ATC's to print and add a little Prismacolor or any other media touch. Below is a sample of how you can alter color on your completed art. It's also a fun way to keep a little scrapbook of cards you have made and mailed. The video below shows you the range the color can be changed with this sample. All I have done is adjust hue. You can also adjust saturation and other enhancements. I used Adobe Photo Elements which is a relatively inexpensive program and has more features than you'll ever use. Save copies of the art sample you like under different names. You can import them into your Word program, create a sheet of cards to size and print on cardstock. 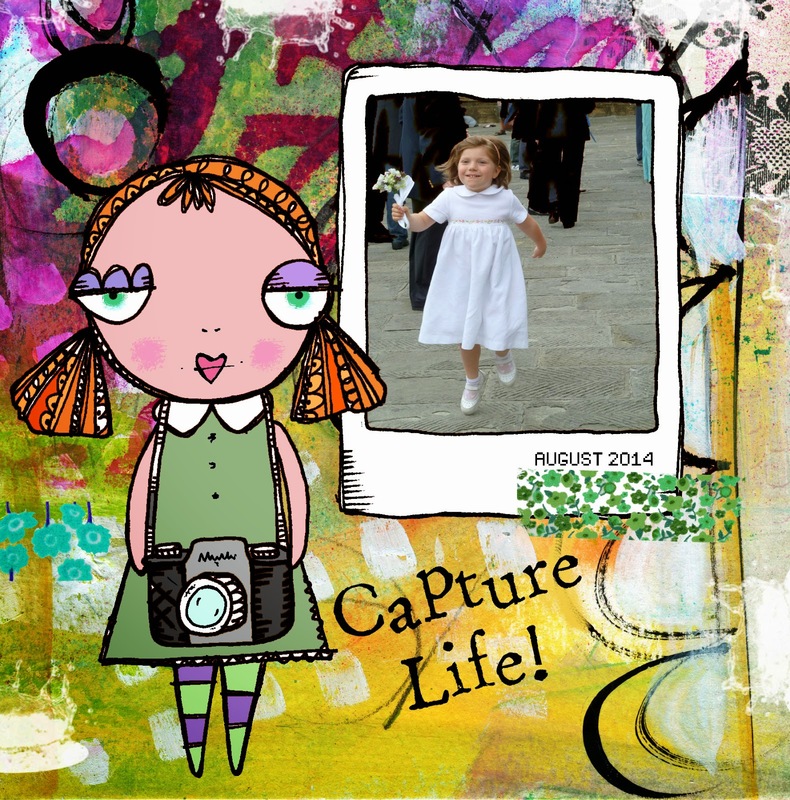 "The Photographer" is Vera Lane Studio's latest digi stamp set. Dorothea (do you get it?) comes with four sentiments and a frame. The frame can be resized to layer with your photographs or use digitally as I have done here. You can also crop another digi image to be inserted in the frame or use Dorothea alone. So capture life! This isnstant download is available with many others in my Etsy shop. I hope you'll check her out! 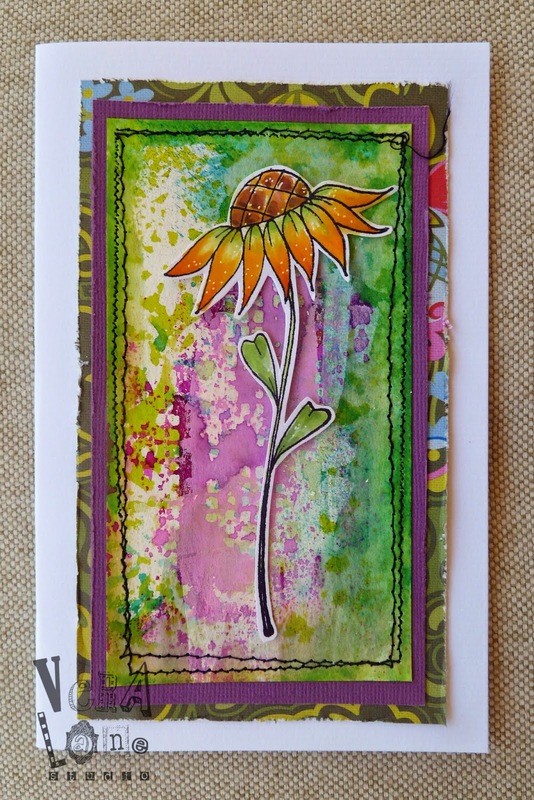 I was happy to see my large sunflower stamp used this week for the SDC161 (Stampotique Designers Challenge) sent out by Kristen. It's interesting to see other artists' interpretation of the sunflower images. My favorite sunflower memory was the abundance of them one sunny summer traveling in New Mexico. Quaint floral yards with sunflower stalks hugging and hovering over fences. My, they were large. The color was intense with a variation of hues on the petals. I thought the line of the single stamped image (in Copic marker) speaks for itself against the sprayed and stencil background. This reminds me of filtered light through a lace certain, perhaps in a little sunny yard in Chimayo. Simple as this card is, it makes for a greeting of most any kind. 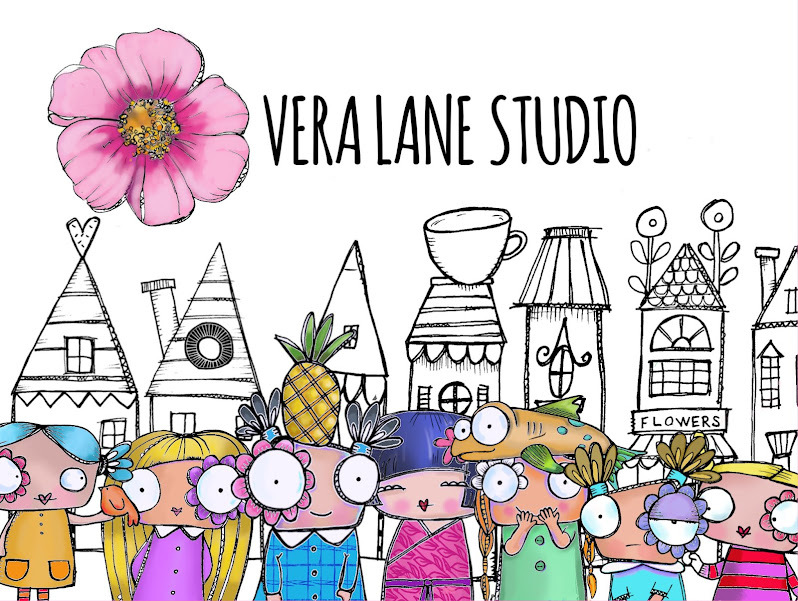 Vera Lane Studio Digi Stamps just released two new image sets. "Hope and Honey" is a set of five files, three images and two quotes. Hope is a sweet little clown that would be perfect for a good cheer card, children's birthday, invites, or a thank you. She is versatile with her little pup Honey. He comes with a hat too! 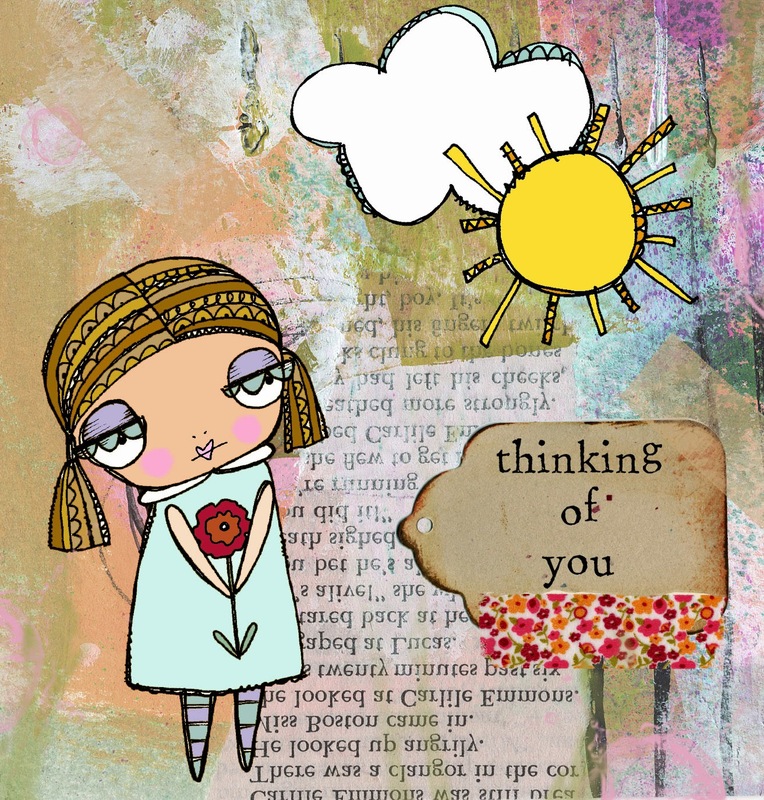 "Thinking of You" is also a five file set. Colette comes holding a flower with a sun and cloud image for layering or using alone. Two quotes are in the set for your designing options. The expression on Colette's face makes her suitable for so many difference uses. The simple sun and cloud images enhance the mood, use together or alone, change the layering to create the feeling tone of your choice. 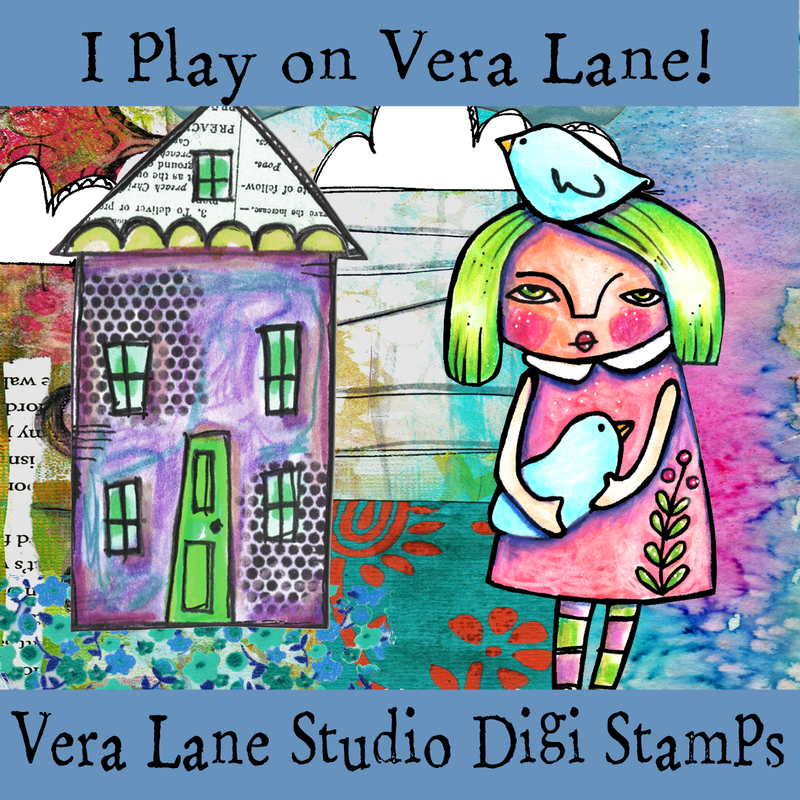 I hope you enjoy Vera Lane's newest additions. The Stampotique Designer's Challenge is sponsored by Kathi this week. She is asking for entries with music as inspiration. I was inspired by Dave Matthews song "You and Me" and had to put these two characters together. Mela and Hunk by Daniel Torrente make a happy couple and even happier against a painterly mixed media background. I used a combination of acrylic and Inktense on a gesso surface. I love taking a liner brush with diluted black acrylic and create some accents. That little pop of black creates a visual balance with the black outline of the characters. The stamped images are stamped with Stazon, clear embossed then colored with Copics. I typed my quote and wet tore the paper edges. Watercolor and Pitt pen accents the frame that gets stapled to the background. This has been a difficult month. Three friends and a relative diagnosed with cancer. The passing of a family friend from cancer. The passing of a friend's parent after a long battle. I pray for hope. Recovery. Complete recovery for our loved ones and others fighting this nasty disease. I wanted to write a reflection of the last few weeks on a tag to include in my art journal. I used Stampotique's hope definition in black dye ink and my bird in a cage is stamped and colored with Copics. The image is purposely offset for some writing. The tag background is a combination of acrylics and dye inks with Bic white out pen. I colored strips of muslin with my Inktense blocks to create coordinating "ribbons." Once dried, the fabric was torn and attached to the tag. Life gets in the way when Vera Lane characters want to come out and play. Sometimes they are peering out of sketchbooks, scattered on the drawing board, or hiding under a cup of coffee. They decide when they are ready to come out. Well, I can tell you this; I try my best to assist their entry into the digital world. Some are very stubborn, but once they emerge, they are all personality and so ready for your interpretation. Monday, August 11th Vera Lane will debut some crazy little characters ripe for Halloween or anytime you need a good boo. A whimsical and nutty duo, and a quirky character you may recognize from the silver screen. 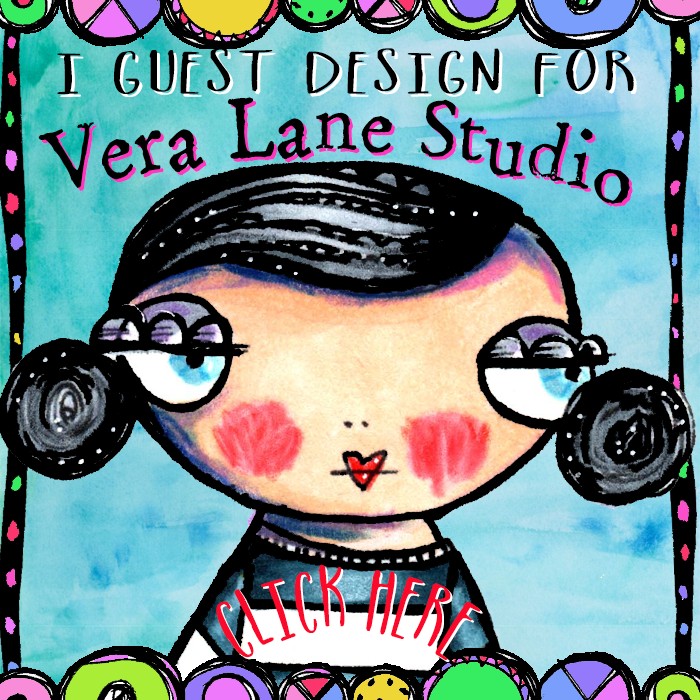 There are two new image sets ready for instant download at the Vera Lane Studio Etsy Shop. Meet Char. She's a little painter complete with a sizable paint can and two quotes. "See Beauty in every day" and "Go to your studio and make stuff." Enlarge Char, print, color and collage to create a whimsical canvas for your studio or as a gift. Paisley is a very sweet addition to Vera Lane. She has a sentimental look, perfect to pair with any sentiment or use one of the two included with the set. Paisley can be standing in her garden or used by herself. All Vera Lane sets are designed to be mixed and matched, or used alone images on a crisp white cardstock. Paisley's image makes for that perfect "thank you" card, "Just to say hello", 'A gift for you", or even an "I'm sorry" card. Her facial expression and handful of lilies can be used for a wide variety of occasions. I hope you like this weeks images. Come back next Monday and see who is around the corner!